Borro del Diavolo is a brook, called “borro” in Tuscany, and it gives its name to the vineyard producing grapes for this Reserve. The best Sangiovese grapes are selected in the first ten days of October from the Borro del Diavolo vineyard and from the close Montignano vineyard, both situated on the same stony ridge facing South. 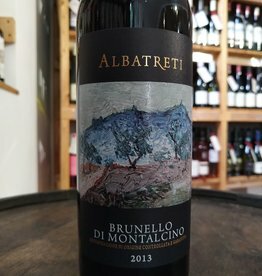 It is structured and it has its own character, it is elegant, harmonious with balsamic notes and excellent fruity notes. The 13th Century Ormanni estate is located right in the heart of Chianti, between the towns of Poggibonsi and Castellina in Chianti. Proof of the incredible heritage of this Tuscan property can be found in Dante's divine comedy ,where the Ormanni family is mentioned. For the last 200 years the estate has been owned by the Brini Batacchi family.The Ormanni property covers an area of 242 ha of land, 68 of which are vineyards dedicated principally to the cultivation of Sangiovese. Suggested food and wine pairing: It accompanies game, roasted meat, aged cheese.